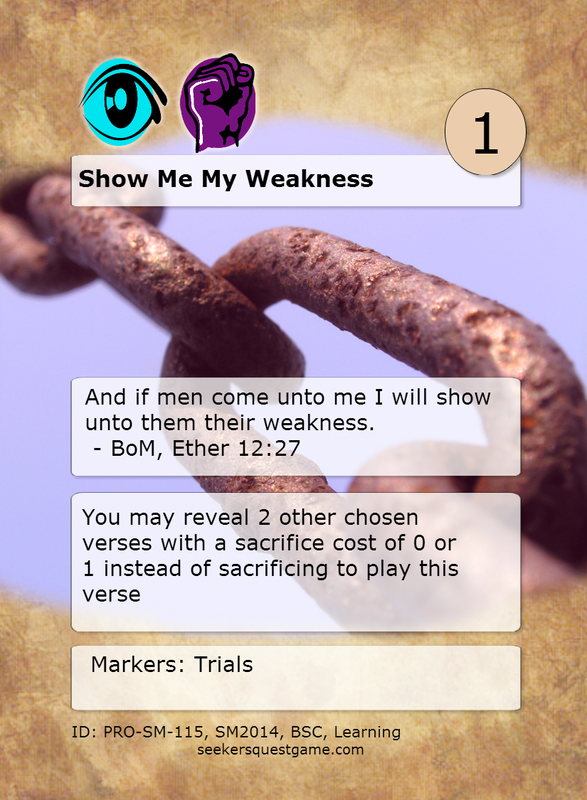 Verse Rule: You may reveal 2 other chosen verses with a sacrifice cost of 0 or 1 instead of sacrificing to play this verse. Here's a Book of Mormon verse this week! This verse goes on to assure us that when we humble ourselves, our weaknesses turn into strengths. This is one that has helped me many times throughout my life as I’ve faced my own weaknesses and challenges. In game, this one allows you to drop a card for free, which can be a nice move in the play phase. That’s especially if you’re about to close out a book and receive some verses from your blessing stack! This verse may be found in the Learning Game set and the Scripture Mastery Set!